طهمورسی, مجید, جعفری, فریبا. (1397). تهیه رس پیلارد شده با آلومینیوم و بررسی اثر pH در مرحله جایگزینی بین لایه ای. 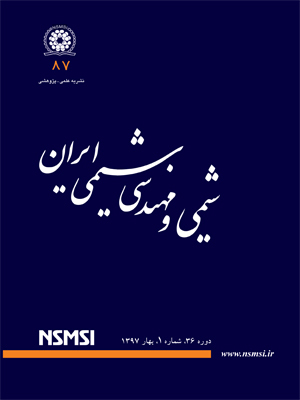 نشریه شیمی و مهندسی شیمی ایران, 37(1), 185-195. مجید طهمورسی; فریبا جعفری. "تهیه رس پیلارد شده با آلومینیوم و بررسی اثر pH در مرحله جایگزینی بین لایه ای". نشریه شیمی و مهندسی شیمی ایران, 37, 1, 1397, 185-195. طهمورسی, مجید, جعفری, فریبا. (1397). 'تهیه رس پیلارد شده با آلومینیوم و بررسی اثر pH در مرحله جایگزینی بین لایه ای', نشریه شیمی و مهندسی شیمی ایران, 37(1), pp. 185-195. طهمورسی, مجید, جعفری, فریبا. تهیه رس پیلارد شده با آلومینیوم و بررسی اثر pH در مرحله جایگزینی بین لایه ای. نشریه شیمی و مهندسی شیمی ایران, 1397; 37(1): 185-195. در این پژوهش نخست یک نمونه بنتونیت از معدن تنگ قوچان انتخاب و مونتموریلونیت موجود در آن از ناخالصی ها جدا شد. از نمونه خالص شده در تهیه رس پیلارد شده با آلومینیوم استفاده شد و سپس اثر تغییر pH در مرحله جایگزینی بین لایه ­ای بر ویژگی ­های رس پیلارد شده بررسی شد.pH مرحله اینترکلاته نخست 1/4 اندازه ­گیری شد و نسبت Al/Clay برابر با 4 میلی مول بر گرم رس در نظر گرفته شد. با افزایش چند قطره هیدروکلریک اسید رقیق pH مرحله جایگزینی بین لایه ای تغییر داده شد. نمونه های رس اینترکلاته شده با آلومینیوم، در دمای 400 درجه سلسیوس گرما داده شدند و سپس توسط الگوی پراش پرتو ایکس و هم ­دماهای جذب/ واجذب نیتروژن فاصله بین لایه ای و سطح ویژه آن ها مشخص شد. نتیجه ­های به ­دست آمده بیانگر آن بود که در مقدارهای pH بین 1/4-7/3 رس های پیلارد شده دارای فاصله مبنایی و سطح ویژه قابل قبولی بودند. بیش ­ترین فاصله مبنایی و سطح ویژه BET)) به ترتیب برابر با 04/18 آنگستروم و 160 مترمربع بر گرم به ­دست آمد که متعلق به رس پیلارد شده با pH مرحله جایگزینی بین لایه ­ای 8/3 بود. Aouad A., Mandalia T., Bergaya F., A Novel Method of Al-Pillared Montmorillonite Preparation for Potential Industrial Up-Scaling, Applied Clay Science, 28(1-4): 175-182 (2005). Fetter G., Bosch P., “Microwave Effect on Clay Pillaring”, Springer, New York (2010). Bergaya F., Theng B.K.G., Lagaly G., “Hand Book of Clay Science”, Developments in Clay Science1246 (2006). Humphrey J.P., Boyd D.E., “Clay: Types, Properties and Uses”, Nova Science Publishers (2011). Caudo S., Genovese C., Perathoner S., Centi G., Copper-Pillared Clays (Cu-PILC) for Agro-Food Waste Water Purification with H2O2, Microporous and Mesoporous Materials, 107(1-2): 46-57 (2008). Hamza W., Chtara C., Benzina M., Characterization and Application of Fe and Iso-Ti-Pillared Bentonite on Retention of Organic Matter Contained in Wet Industrial Phosphoric Acid (54 %): Kinetic Study, Research on Chemical Intermediates, 41(9): 6117-6140 (2015). Tomul F., Adsorption and Catalytic Properties of Fe/Cr-Pillared Bentonites, Chemical Engineering Journal, 185– 186: 380– 390 (2012). Embaid B.P., Biomorgi j.G., Gonzalez-Jimenez F., Josefina Perez-Zuritaa M., Scott C.E., Using Fe-PILC as Catalyst, Applied Catalysis A: General, 400(1-2): 166–170 (2011). Catrinescu C., Arsene D., Teodosiu C., Catalytic Wet Hydrogen Peroxide Oxidation of Para-Chlorophenol over Al/Fe Pillared Clays (AlFePILCs) Prepared from Different Host Clays, Applied Catalysis B: Environmental, 101(3-4): 451–460 (2011). Chen G., Wang X., Zhao C., Du S., Montmorillonite Supported Titanium/Antimony Catalyst: Preparation, Characterization and Immobilization, Journal of Wuhan University of Technology-Material Science, 29 (3): 455-462 (2014). Bankovic P., Milutinovic-Nikolic A., Mojovic Z., Jovic-Jovicic N., Zunic M., Dondur V., Jovanovic D., Al,Fe-Pillared Clays in Catalytic Decolorization of Aqueous Tartrazine Solutions, Applied Clay Science, 58: 73–78 (2012). Gao Y., Li W., Sun H., Zheng Z., Cui X., Wang H., Meng F., A Facile in Situ Pillaring Method—The Synthesis of Al-Pillared Montmorillonite, Applied Clay Science, 88–89: 228–232 (2014). Mnasri S., Hamdi N., Frini-Srasra N., Srasra E., Acid–Base Properties of Pillared Interlayered Clays with Single and Mixed Zr–Al Oxide Pillars Prepared from Tunisian-Interstratified Illite–Smectite, Arabian Journal of Chemistry (2014). Bertella F., Pergher S.B.C., Pillaring of Bentonite Clay with Al and Co, Microporous and Mesoporous Materials, 201: 116–123(2015). .Kloprogge J.T., Seykens D., JansenJ.B.H., Geus W.J.W., A Al Nuclear Magnetic Resonance Study on the Optimization of the Development of the Al13 Polymer, Journal of Non-Crystalline Solids, 142: 94-102 (1992). Furrer G., Ludwig C., Schindler P.W., On the Chemistry of the Keggin AI13 Polymer I. Acid-Base Properties, Journal of Colloid and Interface Science, 149(1): 56-67 (1992). Bottero J.Y., Cases J.M., Fiessinger F., Poirier J.E., Studies of Hydrolyzed Aluminum Chloride Solutions. 1. Nature of Aluminum Species and Composition of Aqueous Solutions, Journal of Physics Chemistry, 84 (22): 2933–2939 (1980). Tomlinson A.A.G., Characterization of Pillared Layered Structures, Journal of Porous Materials, 5(3–4): 259–274 (1998). Bineesh K.V., Park D.W., Structural Modification of Montmorillonite Clay by Pillaring Process: Its Characterization and Applications, Nova Science Publishers, New York (2011). Gil A., Korili S.A., Vicente M.A., Recent Advances in the Control and Characterization of the Porous Structure of Pillared Clay Catalysts, Catalysis Reviews: Science and Engineering, 50(2): 153-221 (2008). Lahodny-Sarc O., Khalaf H., Some Considerations of the Influence of Source Clay Material and Synthesis Conditions on the Properties of Al-Pillared Clays, Applied Clay Science, 8(6): 405-415 (1994). Ge Z., Li D., Pinnavaia T.J., Preparation of Alumina-Pillared Montmorillonites with High Thermal Stability, Regular Microporosity and Lewis/Bronsted Acidity, Microporous Materials, 3(1-2): 165-175 (1994). Gil A., Montes M., Evolution of the Microporous Accessibility with the Hydrolysis Degree and the Intercalation Solution Ageing Time Conditions in Aluminium-Pillared Clays, Microporous Materials, 3(4): 319-329 (1994). Gonzalez F., Pesquera C., Benito I., Herrero E., Poncio C., Casuscelli S., Pillared Clays: Catalytic Evaluation in Heavy Oil Cracking Using a Microactivity Test, Applied Catalysis A: General, 181(1): 71-76 (1999). Kloprogge, J.T., Evans, R., Hickey, L., Frost, R.L., Characterization and Al-Pillaring of Smectites from Miles, Queensland (Australia), Applied Clay Science, 20(4-5): 157-163 (2002). Pinnavaia T.J., Tzou M., Landau S.D., Raythatha R.H., On the Pillaring and Delamination of Smectite Clay Catalysts by Polyoxocations of Aluminum, Journal of Molecular Catalysis, 27(1-2): 195 – 212 (1984). Sanchez A., Montes M., Influence of the Preparation Parameters (Particle Size and Aluminum Concentration) on the Textural Properties of Al-Pillared Clays for a Scale-up Process, Microporous and Mesoporous Materials, 21(1-3): 117–125 (1998). Selvaraj S., Mohan B.V., Krishna K.N., Jai Prakash B.S., Pillaring of Smectites Using an Aluminum Oligomer: A Study of Pillar Density and Thermal Stability, Applied Clay Science, 10(6): 439-450 (1996). Sivakumar S., Ghosh S.K., Damodaran A.D., Warrier K.G.K., Dependence of Concentration of Montmorillonite and Boehmite Sol on the Properties of AI-PILC, Pergamon, 16(16): 2785-2788 (1997). Bradley S.M., Kydd R.A., Ga13, Al13, GaAl12, and Chromium-Pillared Montmorillonites: Acidity and Reactivity for Cumene Conversion, Journal of Catalysis, 141(1): 239–249 (1993). Fetter G., Heredia G., Velfizquez L.A., Maubert A.M., Bosch P., Synthesis of Aluminum-Pillared Montmorillonites, Applied Catalysis A: General, 162(1-2): 41-45 (1997). Schoonheydt R.A., Van Den Eynde J., Tubbax H., Leeman H., Stuyckens M., Lenotte I., Stone W.E.E., The Al Pillaring of Clays Part I. Pillaring with Dilute and Concentrated Al Solutions, Clays and Clay Minerals, 41(5): 598-607 (1993). Plee D., Gatineau L., Fripiat J.J., Pillaring Processes of Smectites with and Without Tetrahedral Substitution, Clays and Clay Minerals, 35(2): 81-88 (1987). Bergaya F., Hassoun N., Gatineau L., Barrault J., “Mixed Al-Fe Pillared Laponites: Preparation, Characterization and Catalytic Properties in Syngas Conversion”, Elsevier Science Publishers B.V., Amsterdam (1991). Molina C.B., Casas J.A., Pizarro A.H., Rodriguez J.J., “Pillared Clays as Green Chemistry Catalysts: Application to Wastewater Treatment”, Nova Science Publishers, New York (2011). Barama S., Dupeyrat-Batiot C., Capron M., Bordes-Richard E., Bakhti-Mohammedi O., Catalytic Properties of Rh, Ni, Pd and Ce Supported on Al-Pillared Montmorillonites in Dry Reforming of Methane, Catalysis Today, 141(3-4): 385-392 (2009). Pan J., Wang C., Guo S., Li J., Yang Z., Cu Supported over Al-Pillared Interlayer Clays Catalysts for Direct Hydroxylation of Benzene to Phenol, Catalysis Communications, 9(10): 176–181 (2008). طهمورسی، مجید; صرافی، امیر; حسینی، سید محمد صادق; منصوری، عبدالرضا ایرج; میرزایی، مرتضی، ارزیابی نمونه های بنتونیت استان کرمان، نشریه شیمی و مهندسی شیمی ایران، (2)29: 91 تا 98 (1389). طهمورسی، مجید; صرافی، امیر; منصوری، عبدالرضا ایرج; لشکری، بتول، جذب یون های مس، روی و نیکل توسط بنتونیت کلسیمی، نشریه شیمی و مهندسی شیمی ایران، (1)32: 7 تا 16 (1392). طهمورسی، مجید; ابراهیمی، عبدالهادی; صرافی، امیر; منصوری، عبدالرضا ایرج; میرزایی، مرتضی ، جداسازی مونت موریلونیت از بنتونیت نوع سدیمی و کلسیمی، نشریه علوم و مهندسی جداسازی، (2)2: 45 تا 53 (1389). De Bock M., Nijs H., Cool P., Vansant E.F., Evaluation of the Microporosity of Aluminum Pillared Montmorillonite: Optimization of The Exchange Process, Journal of Porous Materials, 6(4):323–333 (1999). Bergaya F., Vayer M., CEC of Clays: Measurement by Adsorption of a Copper Ethylenediamine Complex, Applied Clay Science, 12(3): 275-280 (1997). Vaughan D.E.W., Pillared Clays – A Historical Perspective, Catalysis Today, 2: 187-198 (1988). Lowell S., Shields J.E., Thomas M.A., Thommes M., Characterization of Porous Solids and Powders: Surface Area, Pore Size and Density, Springer Science-Business Media, 16: 129-156 (2004).